Ahhhhhhh, my very first paper investment. I've mentioned before that I invested in two mutual funds and one is FAMI. The other day I received an update through them by mail ( yes they mail updates from Philippines to abroad!). I usually don't really check it but for some reason, I did and boy, was I surprised! It grew to almost 100 percent! Note: I am not bragging. My total invested amount in this fund was just small. Red is even expensive than my FAMI but just telling you how time could be our ally in investing- as what I always say. 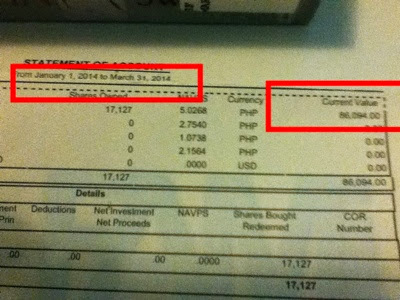 As of January 1, 2014 to March 31, 2014, it is valued at PHP 86,094. 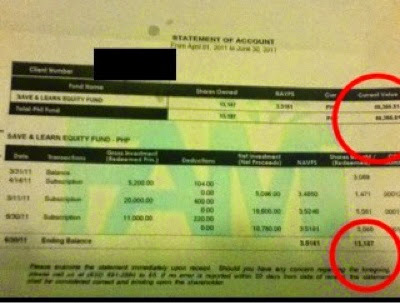 That's PHP 39,728 more! Sweeeeettt!!! It might not be a lot but hey, who would give me PHP 39,728 just for waiting? Sweet, indeed! Note: Nowadays, I invest more on individual stocks more than mutual funds. This mutual fund was kind of like "getting my feet wet" and "testing the water" type of investment. Not bad, huh? I started recently with FAMI but I have been investing in small amount only in another mutual fund - ATRAM Equity. So far as of my March statement, it grew only by 10%. What type of fund did you chose? Based on this site return from Fami for 3yrs old investment didn't even reach 30%? It's the Save and Learn Equity fund. If I am not mistaken, I started buying it around PHP 2.50-ish and the market was so bloody (2011). We don't try yet the mutual funds, I don't have any idea that much about it as we are not planning yet to invest to it. But with your result its convincing to start a little. Thank you for sharing your experience. Happy investing. It's true!Learning how to master your money is the only way for getting rich. Wow! 100% is really really nice! And your investment is not small money at all. It could be 1-2 months of someone's salary already! Got a New Running Shoes! Do You Write Your Dreams?